My last attempt at cheesecake ended in disaster. As usual, it was my fault. The recipe called for a certain size of tin, which I didn’t have, so I used a smaller one. This meant that the filling was too thick, and it didn’t cook through. I only noticed this when I unclipped the tin and saw the cheesecake bulge at the sides, like a dam about to burst. I thought that I hadn’t let it cool down enough, so improvising wildly (something that always seems to make things worse), I whipped the cheesecake into the freezer to try to make it set before the sides collapsed. I don’t really need to go any further. You can work out what happened yourselves. It didn’t look at all like a cheesecake, but it tasted like one, and the disastrous mess was really quite good, but it was still a failure. This episode has troubled me for months now. Surely I can make a cheesecake? It can’t be that difficult, can it? I must be man enough for the job. It’s only a cheesecake. Pride was at stake. So, I tried a different recipe, one with more eggs and less cheese. In a food processor, blitz a dozen good digestive biscuits and a teaspoon of ground cinnamon until you have a fine texture. Pour in 100ml of melted butter and mix. Pour the digestive mix into a cake tin and press it down firmly. Bake in the oven for ten minutes at 180c. 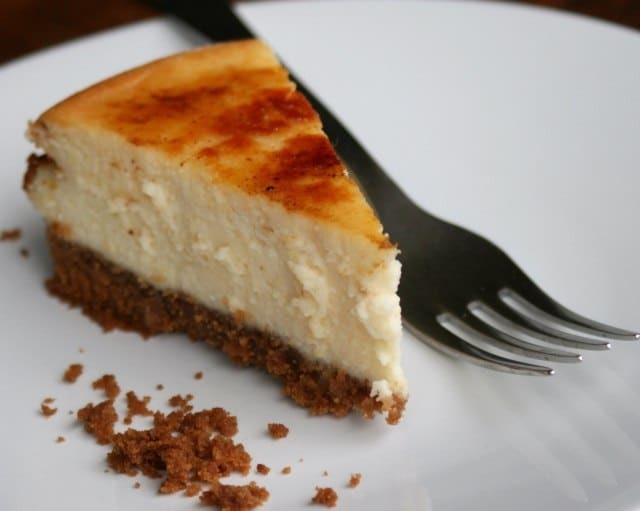 Mix 250g of cream cheese, 250g of mascarpone cheese, 150g of caster sugar, a splash of vanilla essence, the zest and juice of a lemon together in a large bowl. Break two large eggs into the bowl and stir them in well. Sift in a tablespoon of plain flour and mix. Pour the mixture into the cake tin and return the tin to the oven for thirty minutes, or until the filling has set. Try not to let the filling scorch. When the filling has cooked through, remove from the oven and allow to cool. Remove the tin and sift some icing sugar over the top and either use a blowtorch or a hot grill to caramelise the top. A blowtorch is more fun. This recipe is based on one I picked up from The Icelandic Amateur Chef, which is an excellent read with some startlingly good photography.